Update: The National Weather Service has issued a severe thunderstorm watch for portions of eastern Colorado, northwest Kansas, western Nebraska ad southern South Dakota until 11:00 p.m. MDT. 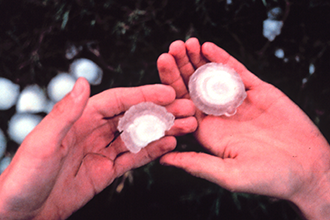 Scattered hail is likely, with isolated areas receiving up to three-inch diameter hail. Tornadoes remain possible. Northeast Colorado counties, including Sedgwick, Phillips, Yuma, Kit Carson, Logan, Washington Lincoln, should be prepared for severe weather that could include golf ball-size hail and a slight risk for tornadoes Saturday afternoon. Similar conditions are possible in western Nebraska and South Dakota. The Storm Prediction Center in Normal, Oklahoma, shows that Sedgwick and Phillips counties, in particular, are at risk for hail two inches in diameter or larger, as well as at a slight risk for tornadoes to form. Wind gusts to 80 miles per hour are possible along and east of a line from New Raymer to Fort Morgan to Limon according to the National Weather Service in Boulder. In other northeast areas, wind gusts to 40 miles per hour are possible. Image: Risk for large hail in northeast Colorado. The black hatched area is at significant risk of hail two inches in diameter or larger, while the orange/yellow area has a 15 percent chance of receiving hail one inch or larger within 25 mile of any location.